I'm planning to leave cold Illinois for Arizona for future winters. Really looking forward to riding year round! We plan to drive our tow capable Ford Explorer which would be our primary Arizona vehicle. (No, my wife won't drive the whole way so I can ride.) Originally I had anticipated renting a trailer to haul the S10 down and back. While I have used UHaul frequently, and they are affordable for "in Town" rentals, one way rentals are significantly more expensive. Decent trailers are pretty pricey to buy, and I have limited storage space in Illinois and Arizona. Likewise, buying a separate Arizona bike is not cost effective. I know the S10 is not to be towed in neutral with the rear wheel on the ground, due to likely drive train lubrication issues. It did occur to me that if the cushion hub could be removed and replaced with an appropriate spacer the rear wheel would be free spinning without any stress on the drive train. A front wheel hitch mount could be easily fabricated, and auxiliary lights wired up. Final option would be a ride and fly, but again the time and costs would be detrimental. I would appreciate any thoughts or suggestions. Buy a trailer, use it for however long and then sell it. Shop around for a trailer and you might find a bargain and not even take a loss when reselling it. There's always some place to store a trailer. Buy a heavy duty hitch carrier that can support the weight of the S10, you may need an extra receiver attached to the Exploder to help carry the weight, or get a Kendon stand up trailer that you can squeeze into your garage. Towing with one wheel on the ground will ruin the tire as it’ll be square by the time you get to AZ. There was the Stinger trailer that was called the Trailer in a Bag. Coud be stored in a closet. Apparently the gentleman has passed on and you'll only find Ebay previously owned trailers. The above idea to buy a trailer and resell makes sense. Harbor Freight or Tractor supply sell trailers at reasonable prices if you can't find one used. But I would do the fly and ride. You say the time and costs would be detrimental, but I see it as advantageous. It'd be fun. Lots of fun -- the routing possibilities are endless. And it's not that far. You bought the bike to ride, didn't you? I'd bet if you do the ride the positive memories would last a lifetime. If you don't do it, when you're 90 looking back, the 4 day savings will mean nothing. The fly and ride option sounds good, as suggested by MCGMB. Frontier Airlines (yeah, I know, not the best service in the World) has one way flights from Phoenix to Chicago for $64 - hard to beat. See attached. Have used them for fly and rides before and it's work out great for me. If you have the space to store it, a Kendon Stand-Up trailer is a great option. I bought my single rail for $1200 and have made multiple trips between AZ & the mid-west with it. I liked this option better than the trailer-in-a-bag option as the Kendon is much more substantial (full sized wheels and a real suspension) and has no issues handling large bikes on long hauls through the mountains and plains. In the up position, it lives along one of the side walls in the garage. 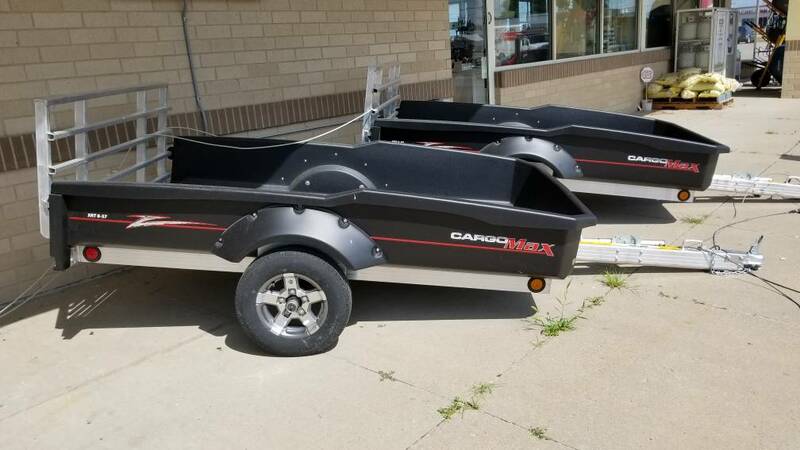 I have a similar need and after searching for trailers for a couple of weeks, scored an older motorcycle trailer that holds two full size bikes or three dirt bikes. Wood deck, new wiring/lights and new tires, for $425. That's less than Uhaul wanted for the one way trailer with a enclosed trailer and less than a third of what a new or larger flat bed open trailer with a rear ramp would have cost me. Doing a 1650 mile move. UT to MS. I'll probably keep the trailer for future use. We plan on picking up a couple of used 250s for poking around fire roads. Just saying that there are deals if you hunt for them. CL, Ebay, FaceBook marketplace and local advertising, keep an eye on them all. Define "limited" storage space. Illinois I get, but since most Arizonans have some sort of toy, parking possibilities are abundant. The two houses I rented when I lived in Phoenix both had more than enough room. I guess the first question should be how money is too much for any of these options? How much is the one-way trailer rental? Next question. Who would want to leave Illinois in the winter? I have a tractor supply wood bed 5x8 ft. trailer for sale with a 1 7/8" coupler and a mounted Harbor Freight Chock. I bought it to take my super tenure across to South Dakota to start my summer trip. (Working on the ride report for this site now). I bought the used trailer for $750.00 and put the $90.00 chock on from Harbor Freight. This all happened in early June and never used it once. I could not trust that my Honda Fit would be able to survive the trip with the transmission sounding stressed and shifting weird. So I rode the Super Tenere 7760 miles in a month. Great trip and glad I did not trailer. But I have no need for the trailer now. I am in South Jersey. I have one of them small harbor freight trailers with a wood top. You can have it to use for as long as you want. That offer said, --- I would not put my Tenere on that cheap junk to go further than across town. I'll be in Apache junction, AZ from Nov 1, lots of great riding there. Let me know when and where you are and we'll hook up. We're right next door in Gold Canyon. Where's your first home? I have been looking. Preferably something used, something standable, that will do interstate speeds. Hard to find anything around $1000. This one looked capable but was around $1800 new locally. Wouldn't ever attempt full weight on the Explorer. If the drive were disconnected, rolling resistance would be minimal, no braking or power, I'm thinking it should wear less than a front tire. Definately less than riding the same distance under the bikes power. I do have an older tire with some life left I could throw on. Harbor Freight or Tractor supply sell trailers at reasonable prices if you can't find one used. Harbor Freight has actually suspended their trailer sales, due to tire failure issues. I would be interested in hearing people experiences with these lower cost trailers. If I thought they would reliably do the job, and handle ~75mph I might bite. Did you buy new for $1200? The web site looks like $2000+. I have seen these on the road.